This book got a great rating from everyone who read it- both stepparents and the existing parent - with frequent comments like, "Direct and to the point and very insightful." I never felt talked down to like some books, nor was there any wasted filler. The author has a very easy style and I can see why he's a popular TV guest to talk about step parenting and family issues. It was a pleasure to read and easy on the eyes, with a nice big photo that tied in with the "do" or the "don't" being addressed, and a clear, readable font below. Some books seem to have crowded or small text and maybe it's a picky thing with me, but I really appreciate books that are well-designed and comfortable to read. There is also something non-intimidating about it which gets dads to read it too. A frequent comment from wives is that it's impossible to get their husbands to read a parenting book - they'd rather she read it and tell him about it, which is not exactly the same as reading it themselves. My husband fits into that same category, but he read (and enjoyed) this one. The best thing about the book was the fact I came away with lots of specific "stepparent helpers." My husband and I each brought one child into the relationship, so we each have one stepchild and one by birth. So that makes each a step parent, and each the spouse to a stepparent. 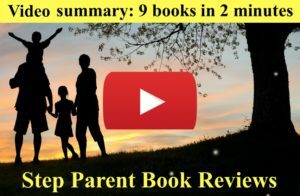 This book addressed issues on both sides of step families, that of stepparent and bio parent, whereas so many book only talks about things from the stepparent point of view. A good relationship means the challenges of both are addressed, however, as this book did. Often I close a book and by the time I was finished, I'd forgotten what I read, even if I was impressed with the book as I was reading. With this book I remembered quite a few key concepts. Yes, some of the dos and don'ts were obvious to me (and I'd guess to many readers), but I really didn't expect someone to come up with fifty completely original ideas. That would have been asking too much. But even the ones that were somewhat obvious were a pleasure to read because of the approach that the author took. I came away looking at some things with fresh eyes even in those issues. I read some specific things that will literally change the way I parent my son, and stepparent my daughter. It has already changed the way my husband parents. For example, my husband was an occasional spanker of our son. I'm not, and we'd argue about it, even though his "spankings" were more symbolic than anything. But the "Don't spank" mini-chapter completely changed my husband's mind. It was only two or three pages and the author addressed the issue in a very non-judgmental way, but after reading it, my husband completely changed his tune . We are a Christian family and it was interesting that the author, Hicks, actually addressed how the Bible looks at spanking, and he completely destroyed anyone's argument that the Bible supports spanking. It was the only time he brought up a religious issue and it was the perfect spot for it. I was actually the book was religion-free as I prefer books focusing solely on the topic. My number two favorite was the "Don't use chores as punishment." I've done that many times without thinking of it, getting mad and sending the kids off to do some chore, thinking it accomplished two goals: get some work done at the same time I was punishing them for whatever it is they did wrong. But now I can see how this approach may develop an anti-work attitude where "work" is subtly associated with punishment. And I love the suggestions Hicks gives to create respect and appreciation for work, to carry with them as kids grow up and need to have jobs, such as having "family chore days" where kids can see parents showing a positive attitude in working together toward a goal. There were quite a few things like that, maybe seven or eight that I will literally use in my day-to-day parenting. A lot of them are equally appropriate to parenting in general, not just step parenting, but I can see how a lot of the issues are magnified when a step parent is involved (such as spanking). I liked that some of the suggestions were specifically empowering to women/moms, which is eventually empowering the daughter in the family who will one day grow into a woman and should view herself with that deserved respect. So hooray for this stepparent book. I can see why it received such outstanding reviews from the most respected book review sources (listed below). 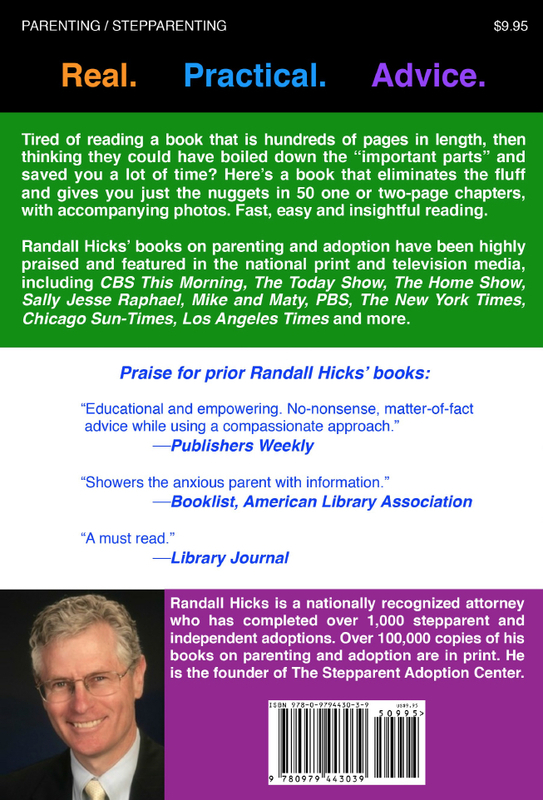 "Hicks offers a brilliantly lean book of tips for stepparents both with and without children of their own. Blended families, whether welcomed or viewed as hostile takeovers, sometimes have bumpy beginnings, but there are approaches that stepparents can take to both ease anxiety and initiate new family traditions. "Step parenting involves special parenting challenges and skills. This book eliminates the fluff and gives you just the nuggets in 50 one-and-two page "chapters," each with an accompanying photograph, concisely addressing a particular issue. 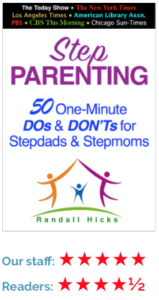 This is practical advice that both the stepparent and existing parent can instantly put to use."